I'm onboard Tramontana, about to leave port. So many last minute jobs to do ! One was to get the Summer Issue of Cruising Yachts online. This is the yachting magazine I am editor of on behalf of the Harrison Butler Association. 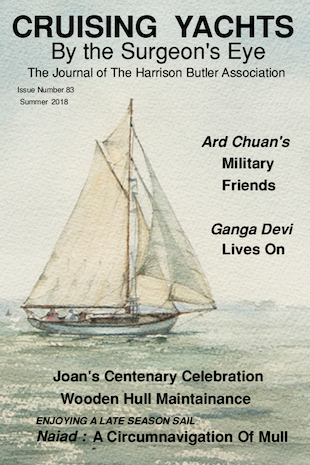 Packed full of terrific articles, it's paid for by the HBA and made freely available by way of spreading the word about such marvellous boats ! A few old photographs of Tramontana's home port in Conwy, North Wales. The marina, discreetly tucked away, was opened in 1992, making use of a basin that had been excavated in 1986 to build six large sections of 'immersed-tube' tunnel that subsequently became a key part of the A55 Expressway. The tunnel now passes under the waters of the upper photograph, c1960. The middle photograph is dated 1926 looking down river, and the lower is from the same place, but looking up river towards the Castle. A gallery of photographs with commentary from Tramontana's wanderings about the Irish Sea last summer are now online . The March 2018 issue of The Gaffer's Log contains a two page article “My First Voyage With Tramontana”. It's a previously unpublished account of a trip up the River Thames with my son James and his wife, Summer 2013, and what happened at sea when the engine failed on the way back to to Harwich. Here's a photograph before it all went pear shaped of James on the tiller as we dashed across the corner of sand bank riddled North Sea to get into the Thames.